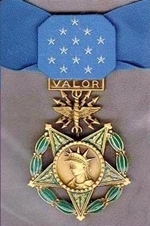 Medal of Honor Citation: Charles J. Loring, Jr.
Rank and organization: Major, U.S. Air Force, 80th Fighter-Bomber Squadron, 8th Fighter-Bomber Wing. Place and date: Near Sniper Ridge, North Korea, 22 November 1952. Entered service at: Portland, Maine. Born: 2 October 1918, Portland, Maine. Citation: Maj. Loring distinguished himself by conspicuous gallantry and intrepidity at the risk of his life above and beyond the call of duty. While leading a night of 4 F-80 type aircraft on a close support mission, Maj. Loring was briefed by a controller to dive-bomb enemy gun positions which were harassing friendly ground troops. After verifying the location of the target, Maj. Loring rolled into his dive bomb run. Throughout the run, extremely accurate ground fire was directed on his aircraft. Disregarding the accuracy and intensity of the ground fire, Maj. Loring aggressively continued to press the attack until his aircraft was hit. At approximately 4,000 feet, he deliberately altered his course and aimed his diving aircraft at active gun emplacements concentrated on a ridge northwest of the briefed target, turned his aircraft 45 degrees to the left, pulled up in a deliberate, controlled maneuver, and elected to sacrifice his life by diving his aircraft directly into the midst of the enemy emplacements. His selfless and heroic action completely destroyed the enemy gun emplacement and eliminated a dangerous threat to United Nations ground forces. Maj. Loring’s noble spirit, superlative courage, and conspicuous self-sacrifice in inflicting maximum damage on the enemy exemplified valor of the highest degree and his actions were in keeping with the finest traditions of the U.S. Air Force.